← Islamic Emirate: US bombings and puppet regime!!! Islamic Emirate: Civilian massacre, ruthless enemy and peace process!!! 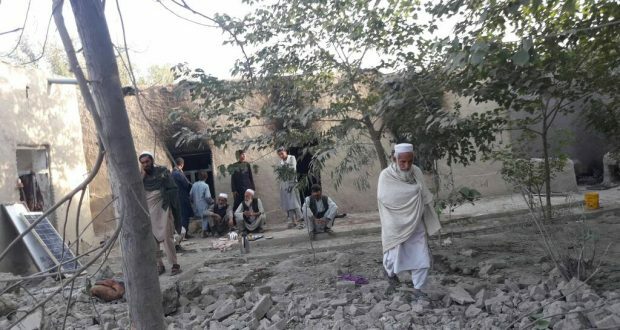 Media activists, while quoting the local eye-witnesses, said that two civilian houses were attacked in a night raid of the savage American occupying forces and their internal mercenaries in Pas-Sabar area of Pachir Agam district in Nangarhar province during which nine innocent civilians were brutally martyred. The eye-witnesses said that these people were forced out of their homes and ruthlessly executed one by one. All of them were ordinary civilian people. Two were shopkeepers and had their shops in the central bazaar, one was a Mulla Imam’(the one who leads congregational prayers), others were ordinary workers and children. Local people who had witnessed the incident said that the martyred people did not even know how to fire a gun. These civilian people were heartlessly massacred while over the past week, twenty more innocent civilians were martyred by the savage American invaders in Kunar province. Prior to this incident, these kinds of tragedies had recurrently taken place because only during last month, more than 750 bombs were dropped in various parts of Afghanistan. The UNAMA’s report is another proof of ongoing atrocities and brutalities of the savage American occupying forces and their internal mercenaries which revealed that during last nine months, more than 800 civilians were killed and wounded in the indiscriminate bombing. The series of civilian massacres by the brutal and ruthless enemy is incessant while on the other hand, the peace process is also conducted by them with great fanfare and show. It was reported from some far-off Arab country that a meeting about restoring peace and stability in Afghanistan was held while the brutal Americans and the puppet administration of Kabul were also participants of these peace efforts. These kind of melodramas are labeled by the foreign occupiers and their internal stooges as peace processes however there is no concept of peace in these meetings because inside the country, the innocent civilian people are massacred ruthlessly without any discrimination. The question is what is the main purpose of the savage foreign invaders and their internal mercenaries from such barbarity, devious and irrational actions? Do they believe that they can succeed in pacifying the freedom loving Afghan people with horrifying tactics and force them to accept their malicious presence and illegitimate invasion? Verily it is a great misconception and vain thought of the American invaders and their internal mercenaries. Instead of doing them any good, such brutalities and violations of basic human rights will further expose their true and vicious nature to the world community. As far as the pious Afghan masses are concerned, they are fully assured that the foreign criminal invaders and their internal stooges will inevitably face a historic defeat and embarrassment very soon and the day is not far off when our beloved homeland will be liberated and peace and stability will be restored .